Want to reach more subscribers, fans, or prospects? Wondering how building a personal brand can help? To explore how to build and use a personal brand, I interview Chris Ducker. 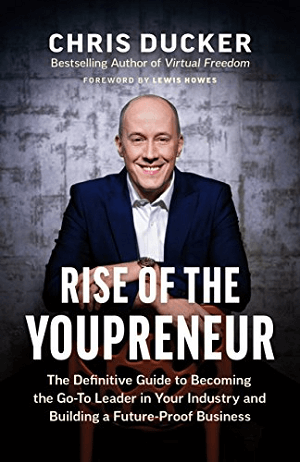 In this episode, I interview Chris Ducker, serial entrepreneur and author of Rise of the Youpreneur. He’s also host of the Youpreneur Podcast and founder of the Youpreneur Summit. Chris explains how to define your niche of expertise and why doing so helps your business succeed. You’ll discover tips for promoting your brand on podcasts, social media, and at live events. 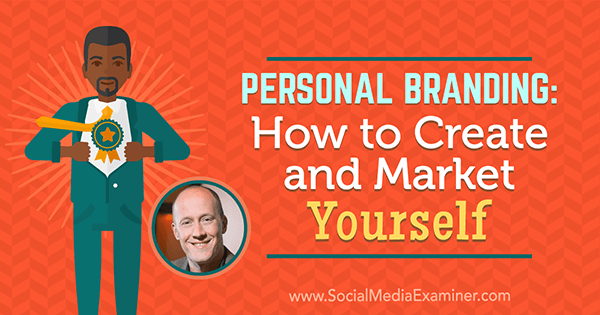 Personal Branding: How to Create and Market Yourself featuring insights from Chris Ducker on the Social Media Marketing Podcast. Chris considers himself a traditional, old-school entrepreneur. Until around 2008, he used the Internet only to check email and watch YouTube videos. The businesses he owned had brochure-like websites that were boring and stuffy. By late 2009, Chris had burned out, as a lot of entrepreneurs do. In 2010, Chris and his wife set a goal: remove him from the day-to-day work of his businesses as much as possible. By October of this “virtual CEO” year, he had hired eight people to replace him, no longer worked in the office, and was working only 4 days a week. In his newly found spare time, Chris started podcasting, blogging, and shooting videos. He devoured Gary Vaynerchuk’s Crush It! in 2 hours and saw a way to build a business going forward. By the end of that year, he had created an email list of about 5,000 subscribers and people were genuinely tuning into the Chris Ducker Show. A couple of years later, while Chris was recovering from back surgery, he began taking stock of how businesses were growing, where they were growing, and what people were doing to build them. That’s when he came to a huge realization about the value of personal branding: In all of his companies’ big acquisitions, people wanted to do business with him first. Only later were they working with his companies. That’s when Chris launched ChrisDucker.com and his personal brand. I ask where “Youpreneur” came from and what it means. Chris says after his personal brand was in place, he started to attract people of the same mindset. These were speakers, content creators, authors, coaches, consultants, YouTubers, and live streamers. They were all building businesses based on themselves, their expertise, and their personalities. A Youpreneur is somebody who’s building a business around who they are, what they stand for, how they want to be known, and whom they want to serve. Youpreneur launched in 2015 as an online community and continues to grow. Chris wrote a book and launched the inaugural Youpreneur Summit last year in London. The summit sold out 4 months before the event. It was a huge success and they’re doing it again this year. Listen to the show to discover why Chris is happier working as an entrepreneur. Personal branding has been around for a long time. For instance, Zig Ziglar is a personal brand everyone knows. What Zig did brilliantly, Chris explains, was to create a brand around his message and how he could affect change. Years after his passing, people still talk about Zig all the time. Some might call that a legacy. Chris calls it leaving a stamp on the world, because of an incredibly strong personality and personal brand. Most importantly, when you talk about people of influence, like Zig Ziglar or someone living, such as Sir Richard Branson, their reputation is their brand. It’s what people say about them when they’re not in the room, at the conference, at the dinner party, or at that coffee meeting. That’s why personal branding is so important. Even if you work for a business that isn’t your own, your personal brand is still important because it can drive or end your career. I mention the two names I believe the world will know: Frank Eliason, who worked for Comcast, and Scott Monty, who worked for Ford Motor Company. They both created huge personal brands underneath their companies’ bigger brands. Frank was known for customer service, and Scott for social media, specifically as it relates to the auto industry. When they left those gigs, their personal brands stayed with them. Listen to the show to hear when and how Chris discovered Zig Ziglar. To start building a personal brand from the very beginning, Chris recommends defining who you really are and what you want to be known for. His book has an exercise called “The Self-Awareness Test” that can help. Divide a sheet of paper into two columns. In the first column, list the things you do well, ways you stand out, how you’re known, and ways you over-provide. In the second column, list all the stuff you struggle to do. Chris says entrepreneurs often have trouble with the second column, which he calls “the get real column,” because they like to think they’re brilliant at everything. After you complete both lists, make a plan to eradicate or delegate the items that you struggle to do in your business. Instead, focus on what you do well because it’s what you’ll be known for. For example, as a speaker, Chris loves to get off the stage, walk around the crowd, and workshop with people. He can and has performed keynotes, but he knows it’s not his strong point. He’d rather roll up his sleeves and get involved in a workshop-style session. He’ll leave the keynotes to people who do them well, like our mutual friend Pat Flynn. When you’re aware of what you do and don’t do well, you’ll flow into figuring out whom you want to work with and serve, what types of things to do, what kinds of content to create, and what kinds of problems you can and will solve. As these points become clear to you, you can start developing a niche or focus for your personal brand. When I ask what he’d say to those who want to serve everyone, Chris says you can’t please all of the people all of the time. Instead, find your niche. Just as professional sports teams have several types of coaches and homebuilders contract with all sorts of specialists, from the architect to the plumber, entrepreneurs need a specialized focus, too. 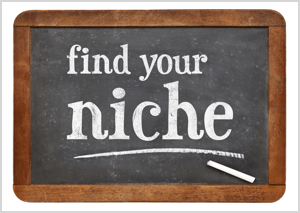 Your niche not only helps you stand out, it also helps you get your messaging right. You create a lot more work for yourself if you try to go too broad because your messaging won’t be clear enough to attract the audience you want. Chris feels frustrated when he knows an entrepreneur can do extremely well in one particular sector or sub-sector of a larger industry, but they try to go broad. Then they complain they’re not growing fast enough, or not making enough money or impact. If they would slow down and look at what they’re doing, they’d see they can affect more change, make more money, and help more people by going after a slightly smaller market. Another example is LEGO, which was on the brink of bankruptcy 10 or 12 years ago, because the company was trying to do too many different things. In 2005 or 2006, LEGO hired a new CEO who said, “Let’s just bring it back down to the brick.” Now LEGO is doing much better. People say, “I want to be a Facebook expert, but there’s already one. Her name is Mari Smith,” or “I want to be an entrepreneurial podcaster, but Pat Flynn already has that niche.” Chris emphasizes that people will fall in love with you for who you are. The goal of content creators, influencers, and thought leaders is ultimately to become somebody’s favorite business podcaster, Facebook expert, or whatever. They want to be so loved that everybody downloads all of their content, retweets it, shares it on Facebook, opens all of their emails, clicks all of their links, buys all of their stuff, comes to their events, and so on. Mari and Pat are amazing, but neither of them can serve the entire world. Believe it or not, some people won’t like them. Other people may want something different. Sally Hogshead said in one of her recent books, “Being different is actually better than being better.” Be different, stand out, be as unique as you possibly can be, and the right people will come your way. Listen to hear what Chris thought about my personal brand the first time we met for lunch. Nowadays, it’s easier than ever to market yourself, but people still struggle. First, they procrastinate. They think their YouTube videos have to be perfect. They think they can’t or shouldn’t be sharing personal things on social media because it’s public. Second, they’re afraid. 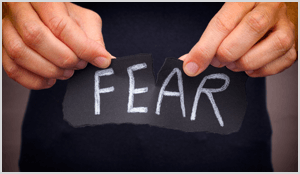 They fear rejection. They fear online trolls. As you become more influential, you’ll publish more content, and more people will see that content. Along with all of the amazing people out there, your content will always attract the odd idiot on YouTube who makes a stupid comment. Just block and delete people, and move on. Don’t procrastinate; don’t be fearful. Put yourself out there. You have to learn to have a thick skin, particularly if you’re building a personal brand and a business around that brand. To spread your message, you can use social media, blogs, and podcasts. In his book, Chris explains in detail how to get on other people’s podcasts in a classy, non-sleazy, non-salesy way. The key is to provide value and be a great guest. To illustrate, Chris’s value includes his experience and personality. When his new book came out, he approached friends who host podcasts (like me) and said, “I’ve got this value that I want to share with your audience. What do you think? Is it a good episode?” The podcast host might respond by asking to tweak the idea and cut some of the content for the show. After agreeing on an approach that works for both parties, they go live with it. Chris believes that when someone of influence puts you in front of their audience, it’s like a stamp of approval. That support for your ideas is incredibly powerful for a personal brand entrepreneur. I note that approval is part of the power of appearing on a show, but the increased visibility you get is also important. You get a chance to share your message with an audience that doesn’t know who you are. If the audience likes the value you provide, they may recommend you to someone else and subscribe to your blog, podcast, or other content. Chris adds that for someone whose business is built on a personal brand, growing your circle, getting on people’s shows, getting on people’s stages with events, being invited as a special guest on webinars, and so on is at the very core of what you do. You’re only as good as the company you keep. Chris also likes podcasts because he can appear on a podcast from his home. 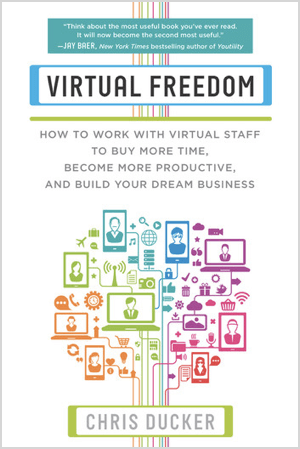 With his first book, Virtual Freedom, Chris went on a traditional book signing and keynoting tour. After being on the road on and off for about 8 months, he was totally worn out. He never wanted to do that kind of promotion again. He launched his new book from his home in the Philippines, where he can spend time with his family every day. He focused on getting on as many great podcasts as he could and providing great online content that can be shared and marketed. When you’re asking to appear on other people’s platforms, you need to make sure you’ve established a relationship with the show or host first, and focus on the value you can offer the audience. Relationships should be treasured, not used. He sees way too much “using” in the online business world. Every week, Chris receives at least one or two blanket request emails, asking people to be a guest at a virtual summit. The senders say they’re a fan and proceed to set out their guest criteria, such as having an email list of at least 10,000 people and sending emails at least three times per week. However, these requests might be the first time the sender has ever contacted Chris. How can he know if someone is a fan if they’ve never tweeted to say, “Hey, great book post,” or shared one of his podcast episodes? Chris blocks the senders of these blanket emails and marks their messages as spam. One of Chris’s favorite ways to market is through social and video. He shows behind-the-scenes details as he grows his business, meets clients, hires and trains staff, writes his book, and puts together a live event. He shares this content via Instagram Live, Instagram Stories, Snapchat, Twitter, or other channels. Chris mentions our show, The Journey, as an example of great behind-the-scenes content. He likes this kind of content because it shows how you get things done. Chris has been hand-writing notes for years. Whether you’re running a business or working for another company, this tactic can build your personal brand. 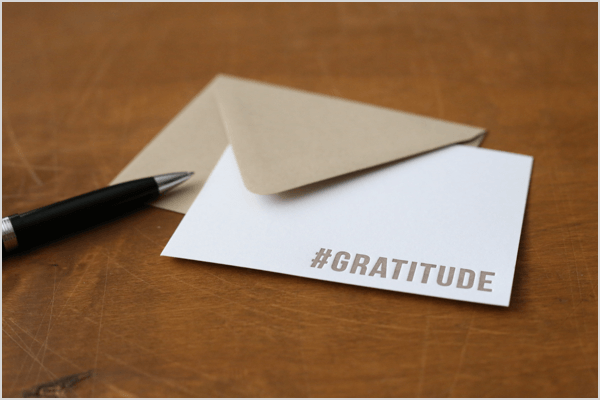 Plus, handwritten notes have a big impact because few people do it. Chris writes notes a couple of times each month to thank customers, suppliers, Twitter followers, Instagram commenters, and others. On a postcard with his logo at the top, Chris can write as much as he wants on one side and put the address on the other side. These notes always make someone’s day. People who receive these cards tweet Chris pictures or email him all the time. Chris also writes notes at live events. As an example, at Social Media Marketing World, if he meets somebody over coffee at Starbucks at the convention center, on the boat, or in a session, and they strike up a conversation, he’ll ask at which hotel they’re staying. Then later he can ask the concierge to deliver his note. Although he could send an email, Chris likes this old-school tactic. It’s a huge lesson for people when it comes to personal branding overall. Sometimes the old ways are better. Listen to the show to hear more of Chris’s thoughts about The Journey and the prediction he makes. SNOW is a selfie app that has nothing to do with the weather. With unique augmented reality (AR) features and filters, SNOW is a great app for creating stories on Instagram, Facebook, and other platforms. Although you can find numerous selfie apps, SNOW has several features that blow the others away. First of all, the facial recognition feature works whether it’s just you or multiple people. This means the AR features (like different faces) can track multiple faces. You can also augment your face with smileys, swap faces, and add other weird or creative effects that help your visuals stand out. The app’s unique filters replicate different types of analog video or cameras. For instance, the VHS filter shows a date and time and makes the video a little bit blurry like video shot on a handheld VHS camera from back in the day. As with many other apps, you can record Instagram Stories vertical videos or square videos, capture stills, and throw on stickers. SNOW is free and available for iOS and Android. Listen to the show to learn more and let us know how SNOW works for you. 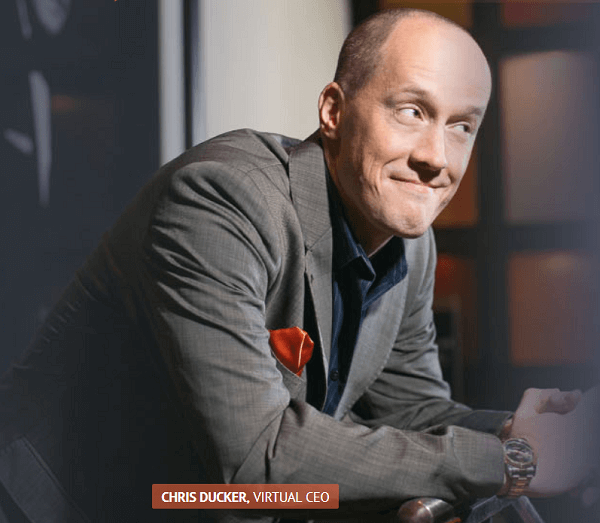 Learn more about Chris Ducker on his website. Learn more about Youpreneur, the book, the Youpreneur Podcast, and the Youpreneur Summit. Read Rise of the Youpreneur and Virtual Freedom. Connect with Chris on Facebook, Instagram, and Twitter. Take a look at Gary Vaynerchuk’s Crush It! Check out Zig Ziglar, Sir Richard Branson, Frank Eliason, and Scott Monty. Learn more about Pat Flynn, Mari Smith, Sally Hogshead, and Gary Vaynerchuk. What do you think? What are your thoughts on personal branding? Please leave your comments below.